The sluggish status quo continues, presenting voters with a decision to make on who can best improve the economy. During his acceptance speech at the Democratic National Convention last night, President Barack Obama asked people to be patient with the economic recovery. “The truth is, it will take more than a few years for us to solve challenges that have built up over the decades,” he said. His advisers are surely hoping this morning that people were listening. The Bureau of Labor Statistics released its monthly jobs data this morning, which revealed that sluggish growth trends are continuing, and a recovery remains elusive. The economy added 96,000 jobs in August, according to the data, which is at about the level needed to keep up with population growth. The unemployment rate dropped from 8.3 percent to 8.1 percent, but only because 368,000 people stopped looking for work. Public sector job losses continue to be a huge problem: 6,000 jobs were lost at the state level in August, and 4,000 at the local level. (The federal government added 3,000 jobs). The public sector has now shed 571,000 jobs in total. The private sector continued to add jobs, for the thirtieth straight month, but a deeper dive into the gains is troubling. The manufacturing sector—which Obama promised to revive last night, with 1 million new jobs—lost 15,000 jobs. Many of the gains were in low-paying sectors: retail (6,100 jobs) and hotels, restaurants and leisure industries (34,000 jobs). But the Romney-Ryan team was quick to pounce on signs of anemic growth. 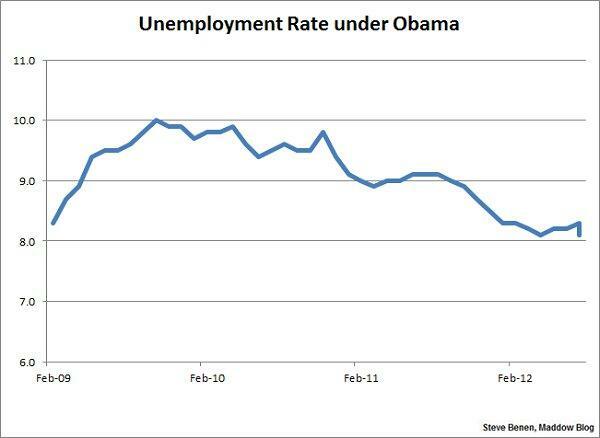 “43 straight months of unemployment above 8%. This is not what a recovery looks like,” tweeted Ryan. “If last night was the party, this morning is the hangover,” said Romney. Ultimately, this was a status quo report, on pace with recent data—it’s just that the status quo is not all that great. Without any major spikes or valleys in the next two months, voters will have to choose based on who they think has a better plan for accelerating job growth. It should be noted that the American Jobs Act—which Obama introduced almost exactly one year ago, and which Republicans in Congress have blocked ever since—would add 2.6 million jobs to the economy, protect 1.6 million more, and 2 percent to gross domestic product, according to the Economic Policy Institute. Romney, meanwhile, has a somewhat vague jobs plan that the Center for American Progress Action Fund estimates would actually eliminate 360,000 jobs next year. Many of the proposals in Romney’s plan don’t change policy, making it hard to discern how he believes they would create jobs. 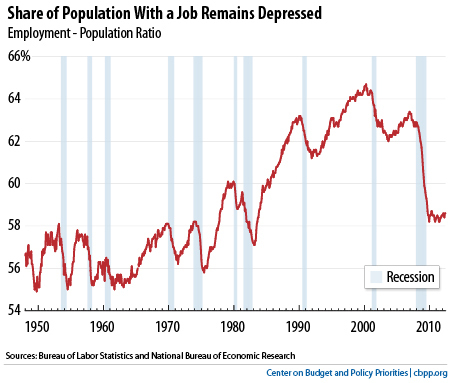 Others, like tax credits for companies that outsource jobs, would obviously depress employment.